As a mother, you want the best for your newborn and you do everything you can to make sure that your baby is safe and sound, especially during the first few days of his life. But this rule applies to everything, even when you're washing your baby's clothes as you have to be careful that you use the right detergent, the right softener and other products that do not harm your baby's soft skin. Make sure you use a mild detergent. Always use a mild detergent for washing your baby's clothes that do not contain any heavily scented chemicals as the harsh chemicals might cause a rash or an allergy. Use lukewarm water to soak your baby's clothes and also wash them immediately to avoid any chemicals being absorbed by the fabric. It is also advisable to use a mild liquid detergent as liquid detergents rinse out more completely than powders, which can leave flakes that might later irritate the baby's skin. Say no to antiseptic liquids. While many mothers think that soaking clothes in an antiseptic solution would kill harmful bacteria that might be there in your baby's dirty clothes, the truth is these solutions might contain harsh chemicals which might get absorbed by the fabric and mingle with the baby's sweat later on. 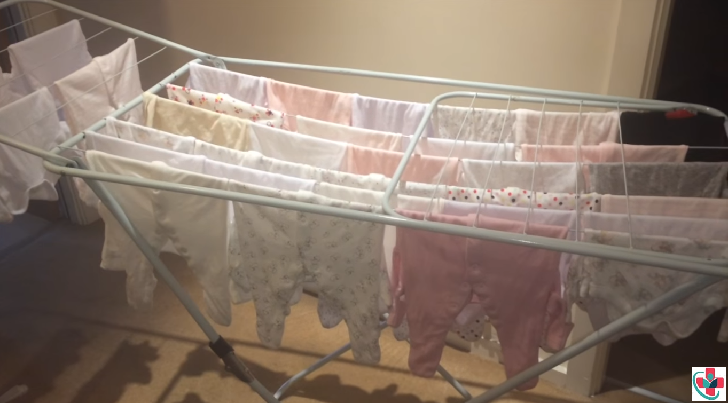 Your newborn's clothes must also be washed separately and not mixed with clothes of your other family members. This is because the dirt or grime from their clothes might come in contact with your baby's clothes and get trapped, which might lead to an infection or allergy. Don't leave milk or other stains to dry and wash them immediately by hand and not in a washing machine. Gently rub the stain with your hands and wash under running tap water for faster stain removal. Never use bleach, ammonia or any other harsh chemicals to remove stains from your newborn's clothes to protect his sensitive skin. Always dry your baby's clothes in the sun. Always dry your baby's clothes in the sun and not the shade as the sun rays can help kill harmful bacteria. If you are blessed with a monsoon baby and are drying the clothes inside, make sure you iron them out to kill any germs and bacteria. Alternatively, you can also use a hair dryer to dry the clothes to make sure all bacteria is eliminated. Avoid washing your babies nappies with the rest of his clothes as bacteria from the urine and any stool remnants might be attached to the fabric and cause an infection. Additionally, you must wrap the baby's nappies separately in a cotton cloth while keeping them in the cupboard.